HORSE poker is one game made up of several, including bouts of Texas Holdem, Omaha Eight, Razz (low card), Seven Card Stud and Seven Card Stud Eight. Limit betting is the rule in HORSE but some tournaments do away with this to rev up the play as the end of the tournament nears. HORSE is a predominant game at the World Series of Poker and can be found in games with high stakes in order to challenge the knowledge and talent of players in multiple games. HORSE is probably the foremost game for the expert players as it demands a thorough understanding of multiple games and their rules and betting strategies. Combination games must be attempted only by those with experience in this genre and only then when they have a firm grasp of the rules before placing that initial bet. This is a limit game, but there are many instances of substantial pots and bets at HORSE tables since the game can become very fast paced. Betting limits range from $2/4 up to extremely high and these limits stand across all rounds played. Most casinos today will offer HORSE at multiple limit tables so the newcomer on up to the professional can get into the action. This is the most played variation and is the mainstay of World Series of Poker. Holdem is a round-type game in which players construct the highest five-card hand from five community cards and two hole cards. None of the hands, one or both of them can be used to structure the highest hand at showdown. Four cards are dealt to each player and at least two of these cards combined with any three of five community cards must be part of the structure of the highest hand. Showdown pots are divided equally between the lowest and highest hands. The low hands must consist of cards between aces and eights. An odd form of poker in that the lowest hand gets the pot. This is similar to the low part of Omaha but there are no hand limits on the low hand. The one with the lowest high card or pair usually comes out ahead, but a superior bluffer has also been known to rule in Razz as well. 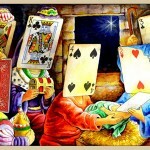 Found everywhere, seven card stud players are dealt cards successively, some cards are visible, some not. He who holds the highest five-card hand gets the pot. This one follows the same direction as Omaha Eight with its split pot for the lowest hand below eight. 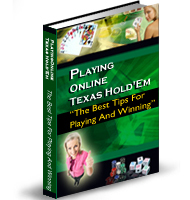 For more information on how to play other poker games like 5 Card Draw or Texas Holdem please visit Rakeback Solution.